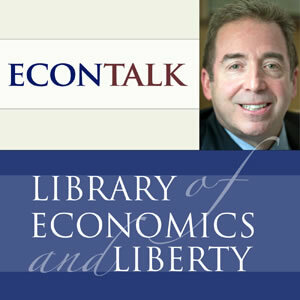 The Library of Economics and Liberty carries the podcast, EconTalk, hosted byRuss Roberts. The weekly talk show features one-on-one discussions with an eclectic mix of authors, professors, Nobel Laureates, entrepreneurs, leaders of charities and businesses, and people on the street. The emphases are on using topical books and the news to illustrate economic principles. Exploring how economics emerges in practice is a primary theme. Listeners are able to comment online on recent podcast episodes. All current and prior episodes are archived and available free of charge. Podcast episode discussion and questions for personal or classroom use are offered on selected episodes as EconTalk Extras--blog posts--and as teaching-oriented Listening Guides. EconTalk was voted Best Podcast in the 2008 Weblog Awards. It took 2nd place for Best Podcast two years in a row in the 2007 Weblog Awards and 2006 Weblog Awards. EconTalk got started in March 2006 with podcast episodes every two weeks, and went weekly in the summer of 2006. New episodes are released on Monday mornings. They are available for listening on any computer, mp3 player, or smartphone, and are also distributed through iTunes and other intermediary services.